Audiobooks. In my experience, they can be hit or miss. A well-plotted and suspenseful story filled with wonderful characters can still fall flat if the audiobook narrator doesn’t capture the excitement and flavor of the book. And a great audiobook can elevate a story by adding to it; different voices, high production values, well-placed dramatic pauses, etc. I’ve enjoyed many a great audiobook, but I am about to say something that would have shocked me a few months ago: I’ve found an audiobook that I think is BETTER THAN the print book. This gem-for-your-ears is a middle-grade novel called Echo, by Pam Muñoz Ryan. It was published in 2015, and I recall seeing it on some “best audiobooks of the year” lists around that time. I put it in my “to listen to” queue and promptly forgot all about it, until this summer when I needed a new audiobook to listen to during a drive. I went in knowing nothing about it, and was thrilled to discover the reason why this makes such a great audiobook: the plot revolves around music. Of course! What could make more sense for a brilliant audiobook than one which includes such an important non-word element? It’s a perfect match. 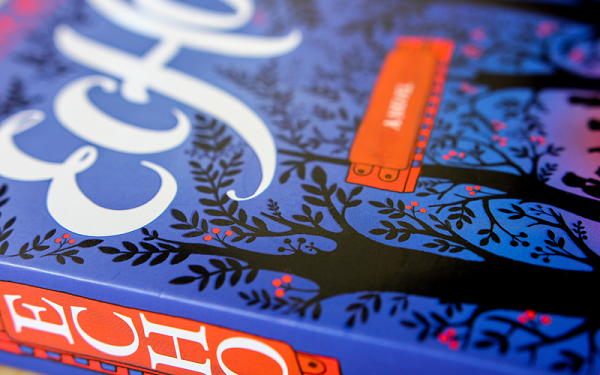 Echo is broken into three main parts, bracketed at beginning and end by a shorter story about a boy named Otto and his discovery of a mysterious book. The layers of plotting here are wonderful; near the mid-point I started to get the sense that all the stories would be connected somehow, and Ryan wraps everything up brilliantly in the end. I especially appreciated the diversity of the three main protagonists. The reader gets to know two boys and a girl, one with two parents, one orphaned, one living with his father, each with completely different life experiences and perspectives, even though all of their stories take place within a few years of each other. The audiobook narrators—Mark Bramhall, David de Vries, Andrews MacLeod, and Rebecca Soler—each take on a different main character, which really helps to give a distinct sense of their personalities right from the start. “At the end, Mr. Potter seemed to goad the song into wailing…. He played two chords. He played a note, bending it. Now, imagine that paragraph liberally sprinkled with bits of actual harmonica playing, and you’ll understand a bit of what the audiobook experience of Echo is like. I enjoyed it so much, I’ve been wracking my brain trying to think of other audiobooks that might have hidden musical secrets for me to discover! I hope they’re out there waiting for me, just like Echo. The Little House audio books narrated by Cherry Jones. These do a great job of integrating Pa’s fiddle music. Just now saw this recommendation, Bethany – thanks! I’ll check those out.